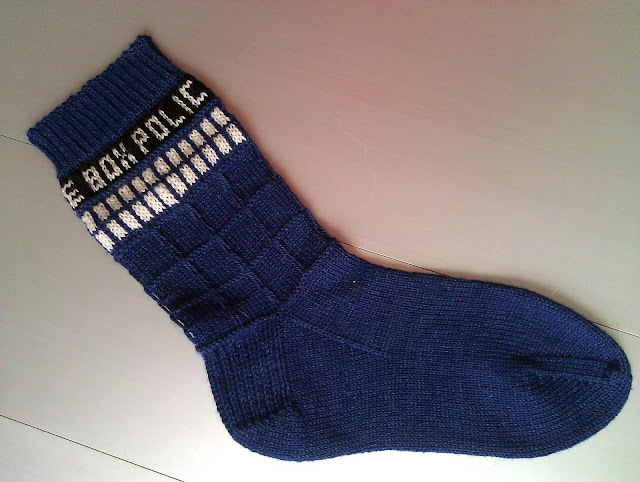 Clever Knits: WIP: Tardis Sock! I've only got one of these finished. One of these days, I swear, I will cast on the other one. I think it's the colourwork that's keeping me from casting on. It's not very much colourwork, but I forgot just how much I abhor it. Intarsia is not as bad as fair-isle, but I am not a big fan of either. So, this solitary sock languishes with no companion with whom to travel through time and space.